Pilgrims at the Australian Gathering in Tauron Arena, Krakow. World Youth Day in Sydney changed the landscape of youth ministry nationally, the Australian bishops said today during a national gathering of Australian pilgrims currently participating at World Youth Day (WYD) events in Krakow, Poland. Today, the Australian Bishops joined more than 3,000 young people at a national Australian gathering during WYD Krakow that included a launch of the ‘Year of Youth’, building on the legacy of World Youth Day 2008 (WYD08). 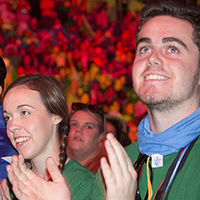 The Year of Youth will celebrate the tenth anniversary of World Youth Day, Sydney and highlight how the Australian Church continues to tell the story of WYD08 in its local ministry. This entry was posted in Press Releases, World Youth Day and tagged Aussie Pilgrims, Australian Gathering, World Youth Day on July 27, 2016 by ACBC Communications.